Starting with a plain white palette (upper left-hand corner and going clockwise), each layer went down in a painstakingly slow manner, measuring to make sure every element was precisely set. Starting with the photo in the upper left-hand corner of the collage and going clockwise, I started by layering two chargers: One a square rattan, and the other a round silverplate. By layering the two, I felt it gave the table the depth it would need once the plates were removed to the kitchen for the actual dinner. It also added both a sort of rough-hewn texture and a glossy shine, two elements I thought represented the surf and turf theme. The square white dinner plate was a good foundation for the colorful mix of blue and white starfish salad and appetizer plates you see here. These plates were in place upon the guests’ arrival, but then whisked to the kitchen just before the start of the meal. The cobalt blue stems, seen in various posts on this site, were for water and the clear stems for wine. The rest of the centerpiece that extends down the length of the table includes a number of repeated elements. 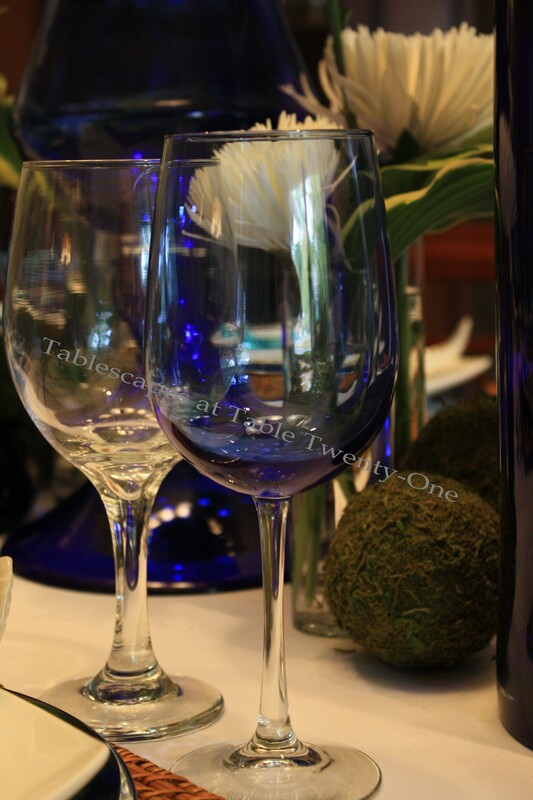 Cobalt blue cylinders with the same color as the water stems have chunky white candles for ambient dinner light. Smaller clear cylinders, mimicking the colorless wine glasses, dot the table with white Fuji mums. Smaller moss balls and a few cobalt blue votive holders complete the look. It was an honor and a delight to work with Mary Stilley who was most gracious to Sheri, Ramon, and me as we set up and broke down the table. She is indeed “The Hostess With the Mostess”! Many thanks to the Lee’s Summit Educational Foundation, its Board of Directors, Advisory Board and staff (including Sheryl Franke!) for allowing me to participate in the auction for such a worthwhile cause. I’m joining Cuisine Kathleen for the fun blog party known as “Let’s Dish” starting at 6:00 p.m. CDT on Wednesday. 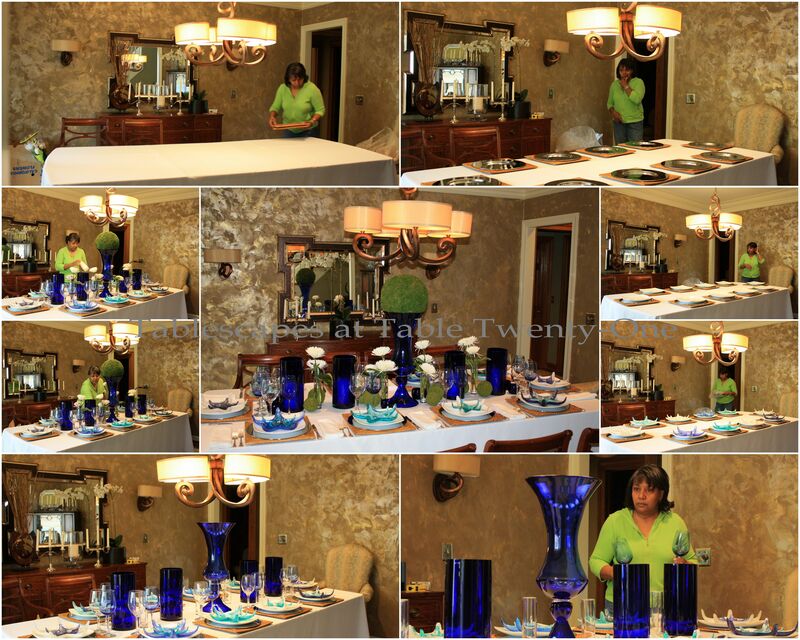 I’ll also be joining Susan for “Tablescape Thursday” on Thursday morning starting at 9:00 CDT. 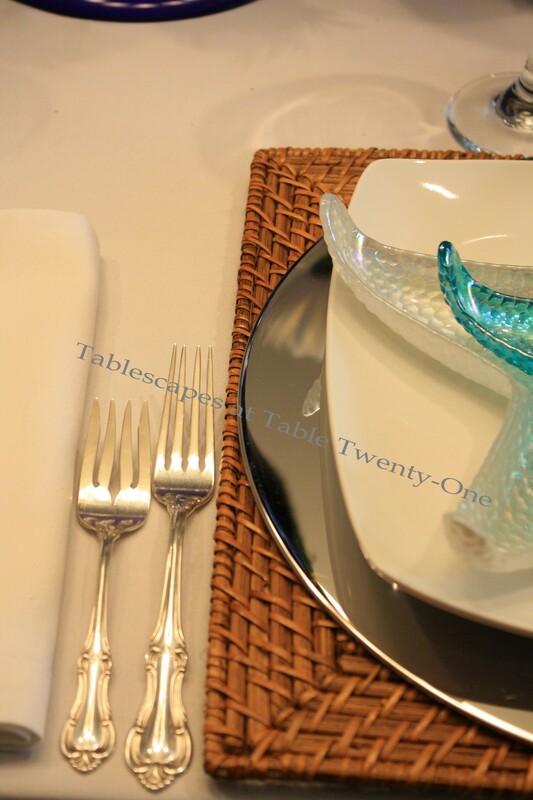 If you want to see the work of some really talented tablescapers, click on over to join us! ← Purple + Green = Happy Birthday! You’ve yet to disappoint with the tablescapes! 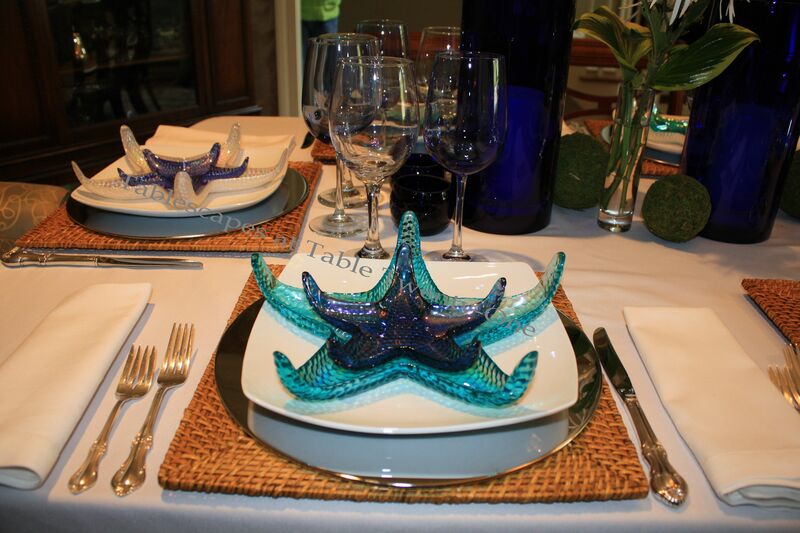 I love the cobalt blue glass, and the starfish plates. The use of different shaped plates is fun as well. I have no doubt the hostess was pleased. Wow, this is stunning. I love all the shades if blue. How beautiful your blues are! Love those wonderful starfish plates! They’re amazing. Wow I think it turned out quite magnificent! I can’t even begin to imagine what it would be like to win something like this and actually have someone come to my home and set it up like that! What a generous thing you did! You had to lift the chandelier higher too! OMG! I like the rattan charger like (sand) and the shiny charger like (water)! Love those starfish plates! The cobalt blue makes a dynamite impact! I certainly hope the hostess was thrilled with it! I would be! You say what an honor it was that you were able to set such a magnificent table for the Foundation….but I see it this way too, it was an honor for them to have YOU create the gorgeous tablescape for their guests. It is obvious that you carefully planned every inch of the table…the place setting is stunning! !…I so love the starfish and the cool colors of the “surf” and then you added such a wonderful texture of the moss balls for the “turf” … fantastic idea….you truly outdid yourself and it is no wonder that the guests loved it…great, great job Alycia! !…now…on another note, yes, I would have loved to have been a fly on the wall to see you guys battle that chandelier! Wow, Alycia, you really outdid yourself (if that’s even possible)! You captured every detail perfectly. The dinnerware, stemware, chargers…everything. It’s just perfect. Starfish plates the art of entertaining, just lovely. It came together I had no doubts. WOW! Spectacular table. everything is so clever pulled together. Your centerpieces just blow my mind. Ooooooh……my mind is going overtime just thinking of you trying to alter the light fitting. I’m thinking, way too hard but once again your attention to detail was just perfect. Lovely, lovely, ,lovely!!! (Yes, you and the table!). WOW! Alycia your table is wonderful. I love blue so much, and those starfish plates are awesome!!! Beautiful, beautiful!! Those starfish plates are so lovely. I clicked expecting the usual lobsters and fishnets (which I love too) – I should have known better with you, it would be unique and gorgeous. Hi Alycia, This tablescape has to come close to the top of the chart as one of my favorites! 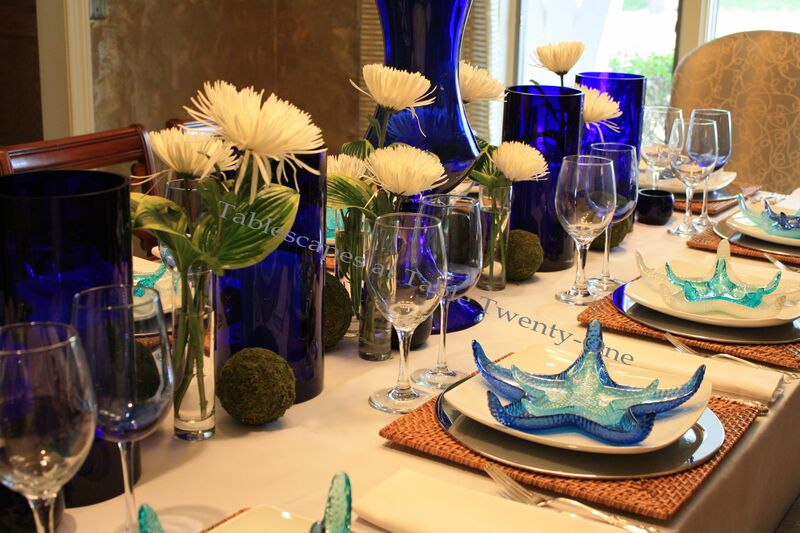 Love the cobalt blue, so gorgeous and the starfish plates are awesome. Beautiful and elegant! OMG…this table is so very impressive, Alycia! I love the cobalt/white with the little bit of aqua pops. If I ever throw a dinner party that needs special touches I am hiring you! Love all of the shades of blue. 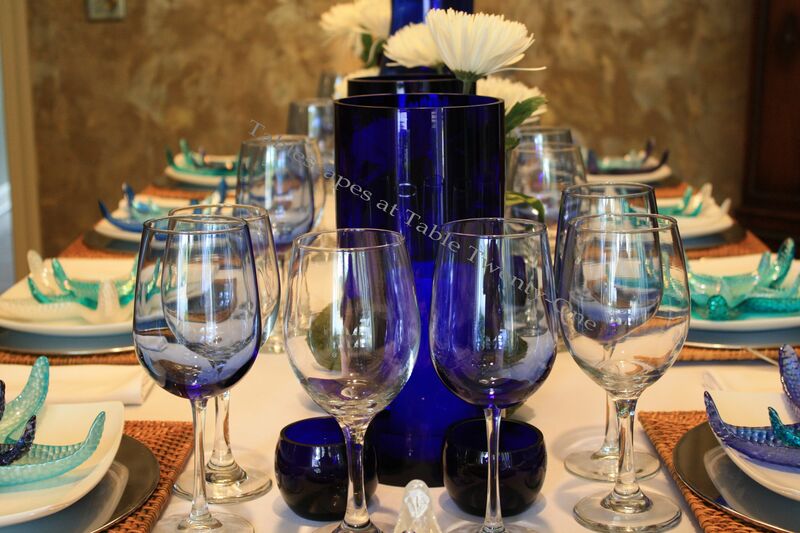 I finally scored a set of the blue stemware…I won’t confess on how many stops I had to make to complete the set…but it is now complete and can’t wait to use them! Thanks for sharing your beautiful table…you never cease to amaze me! Beautiful Surf and Turf Table Alycia~ I know she was thrilled! I love the collage and seeing you in action, deep in thought 🙂 Those starfish plates are wonderful! YOU are the hostess with the mostest! Fantabulous interpretation Alycia!! Gorgeous as always! Lovely tablescape Alycia. The cobalt blue is a favorite…so bold and striking. Love your centerpiece. 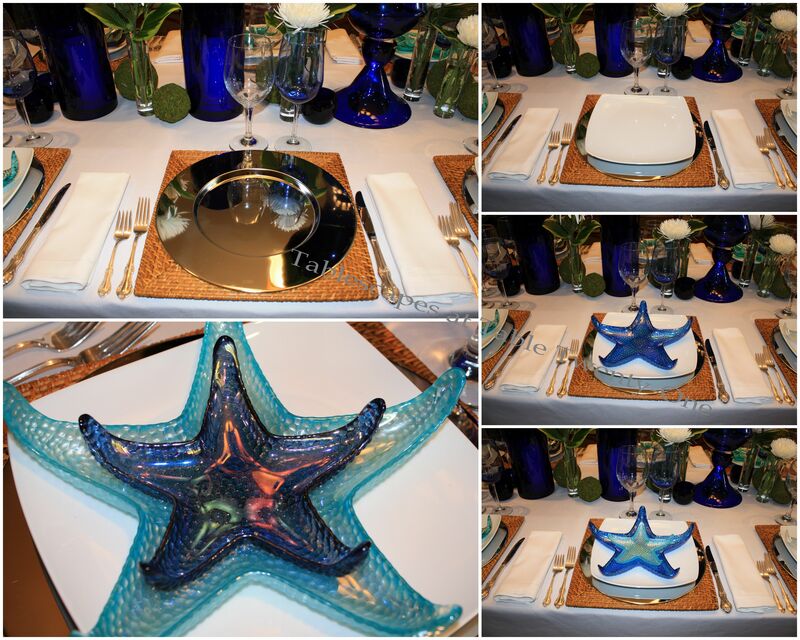 Those starfish plates are incredible…Great idea on the collage…Pretty special…. You always “wow” me with a fabulous centerpiece!! I love that big moss ball in the cobalt vase. Those starfish layered plates are stunning. Great table, Alycia! Stunning!! LOVE the colors and those starfish plates are gorgeous! 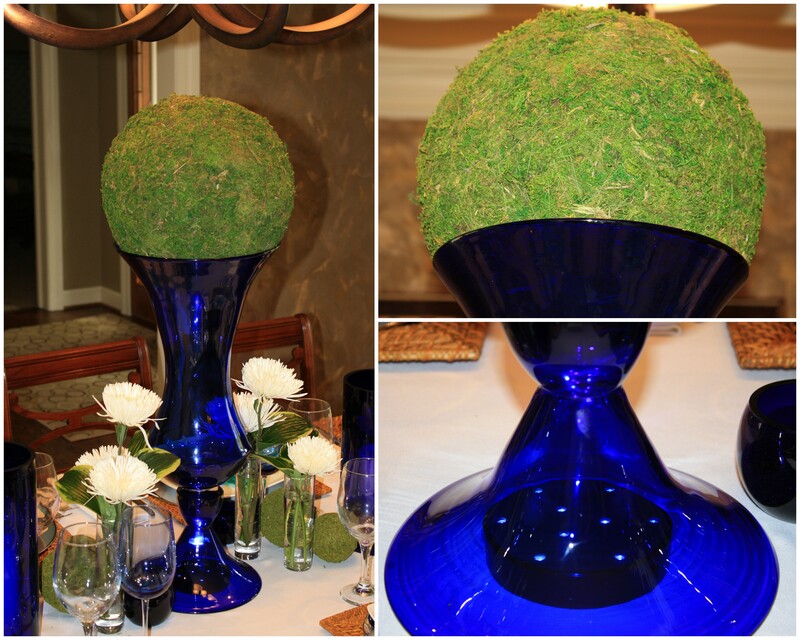 I also love the blue vase with the moss ball…..so pretty!! Thanks so much for stopping by and I hope you have a wonderful night! Wow. 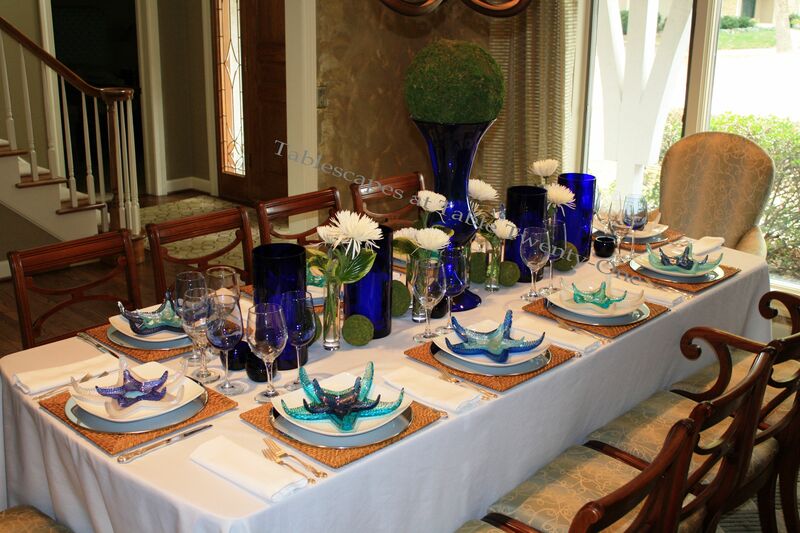 Love that tablescape, especially the blue star fish plates. Well done. Another beautiful tablescape! I love the starfish plates! This table just blows me away. The starfish plates are du-no-mite, but I have to ask what was served on them or were they just for impact? They certainly impacted me. I am sure the lucky winners of your creativity were duly impressed. BTW, how is the shoulder? Wow Alycia, what an AMAZING table. The starfish dishes are so unusual and beautiful. Love it all!! You are truly a tablescape artist. 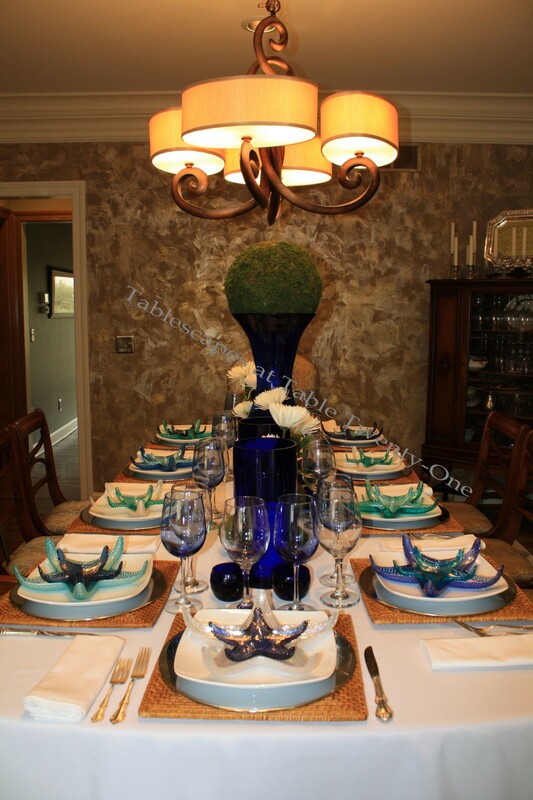 Alycia, I love your starfish plates so much that I used them in this weeks tablescape as well. That’s what I love about sharing tables with eveyone, we can take the same items and come up with completely different looks. I’ll have to try cobalt next time. I am starting to wonder if you ever sleep, or does your mind just create beautiful visions of tablescapes all night. This is just so impressive, so beautiful with the cobalt blue used in the centerpiece all the way down the center of the table. Great representation of surf and turf, you never cease to amaze me. Gorgeous!! Oh my goodness, my friend, you are a gifted lady and I can understand Ramon now…YOU DON’T SLEEP, YOU AGONIZE over your tablescapes..that is very worrying, honey. 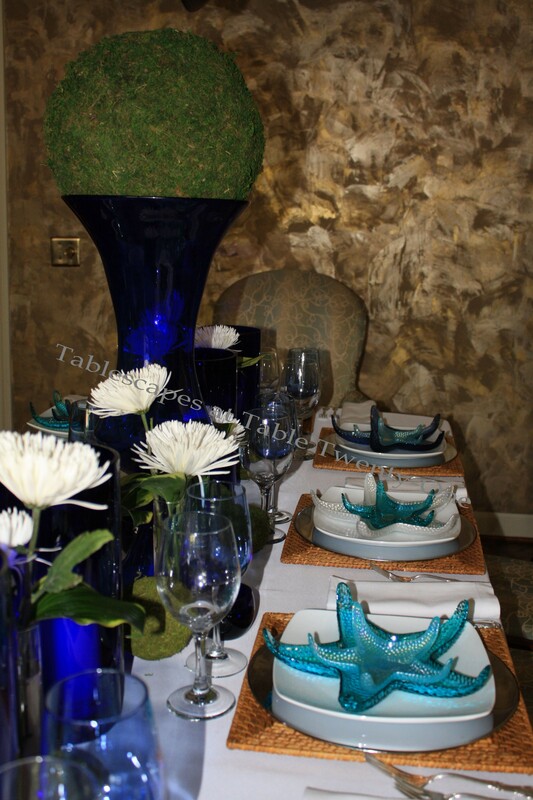 I love the long center arrangement with all those blue pieces and the star fish plates blow me away, wow!! I totally love those plates and what are you serving in them, or are they just for an amazing decoration statement and to make me jelous and envious?! Well, sweet pea, this is another fabulous and exquisite tablescape creation of yours. I so enjoy coming over to your place and visit, as I’m never dissapointed! Have a great and safe weekend. Thanks for your lovely visit, I love it when you do! Beautiful!! I, too, snapped up those starfish dishes. However I do not have anything else to go with them so I am saving them for next summer!! I love the way you used the moss balls with the blue vases. 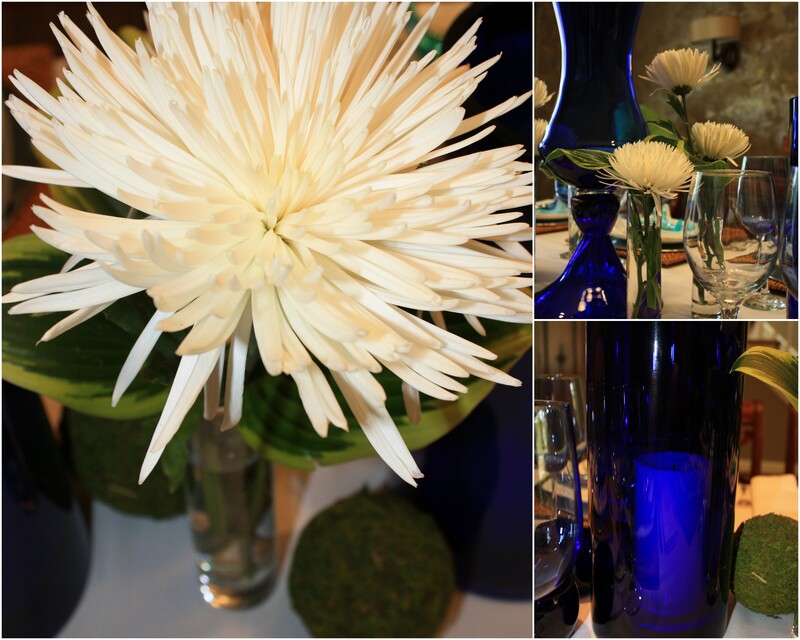 The whole line of cobalt accessories makes for a stunning centerpiece. What a super fun take on the surf and “turf” idea. I had to think about it for a minute before I got it! I love, and I mean really love, those starfish plates! so pretty – the textures that you combined are great together and that cobalt blue color gives the table a beautiful look! WOW!! Those plates are so awesome! First of all, I loved the white plates, then of course the starfish plates. I always love cobalt and I have to learn more about that little lite. Amazing, You’re the ONE! Take a bow, this is beautiful! Please also let Sheri know how gorgeous her pictures are. That is really lovely. Those starfish plates are amazing! Love all the interesting elements of this table!